Gicco New York Supreme Water provides invigorate hydration, health benefits and smooth taste. 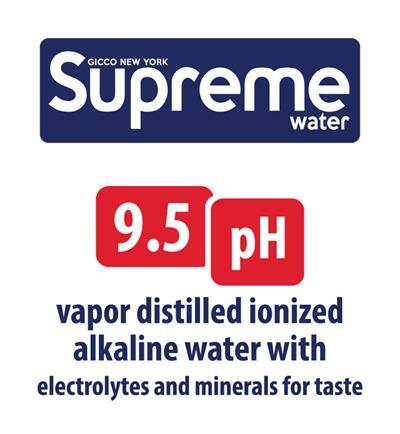 Its Supreme hydrating qualities come from Vapor Distilled ionized alkaline water with electrolyte and minerals formula and optimal level of 9.5 pH. HYDRATE YOUR BODY NATURAL FOR BETTER HEALTH DRINK SUPREME WATER YOU`LL TASTE THE DIFFERENCE! NO CALORIES. NO SUGAR. NO CARBS. NO SAT FAT. NO SODIUM.